As hikers, we get to experience things that few others get to experience. Our sense of adventure and our physical capabilities allow us to roam on paths and in places only seen by those who dare venture into the wild. We are the lucky ones, and we share this precious wilderness with those creatures and people that live there full-time. With such luck and opportunity comes great responsibility. Too often, our trails are littered with trash and miscellaneous debris. Our waterfalls and trees are covered in graffiti; our rocks etched with names and curse words. 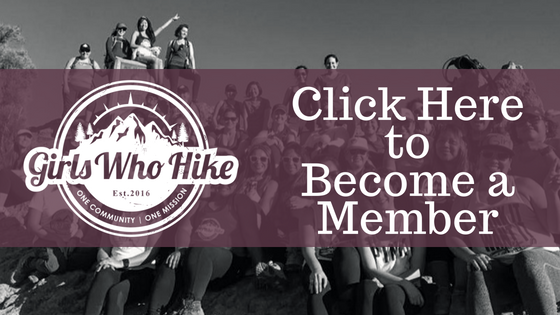 The Girls Who HikeTM community is committed to protecting our trails and our natural surroundings. We are committed to following the trail etiquettes established by our state and national park and forest systems, and hope that you’ll join us in keeping our hikes wildly natural. Here are our unwritten trail commandments for your consideration. We hope that you’ll learn them… and share them! Stick to the Trails (especially in sensitive habitat): Some of the places we like to roam have sensitive habitat - that is, habitat that is in the process of being restored due to natural destruction, or vegetation that protects the soil from subsiding or provides animals with shelter. Stay on established paths, and pay attention to “No Pass” signs when you come upon them. Know Your Trails: Some trails are well marked, and some are, well, less so. Make sure you know how to read and understand trail maps before you hit a trail on your own. There are a lot of good websites and apps that can help you with this (Modern Hiker, AllTrails, etc). Use them! Print out your map before you go, and don’t depend on your phone’s GPS (or fellow hikers) for guidance. Your phone may not have service, and other hikers may be just as lost as you are. Yield the Right-of-Way: Just like driving on the road or the bike path, respect the “rules of the road.” Not familiar? Remember that the biggest object on the trail has the right of passage. I mean, do you really want to test who will survive a hiker/horse or hiker/biker collision unscathed? Uphill hikers have the right to pass downhill hikers. As a downhill hiker, you can see what’s coming… can they? Slow hikers to the right. This is for your safety. If you hear, “On your left!”, stay to your right. That usually means someone moving much faster than you is coming up behind you. Don’t get ran over, and don’t cause an accident. Hike no more than two across, and single file on narrow trails. Don’t you just hate when you’re trying to walk somewhere and a family of 6 is lined up horizontally, blocking your passage? Yeah, we do too. Stay together, but do it in pairs. Pack It In; Pack It Out: It’s really simple - If you took it in with you, take it out with you. Yes, I know that those banana peels are “natural” but they can hurt local wildlife. And please take your trash with you! We don’t do these trail cleanups because they’re fun (ok, so…. maybe we do); we do them because other hikers are leaving their junk behind. Pick up after yourself, and your pets too. The wildlife and other hikers will thank you! Don’t Feed the Bears! : Seriously, don’t… and don’t feed any other wildlife either. Feeding animals is dangerous to both you and to them. You know how your favorite dog can’t have chocolate, right? Do you know what a squirrel can eat? No? Me either. Be on the safe side, and let them forage as nature intended. Leave No Trace: About a year ago, a young lady in Southern California made headlines because she went across the United States defacing rocks and trees in National Parks in the name of art. She was banned from all National Parks for two years. Don’t be this girl. Leave it as you found it. I know many of us love the cairns at the Wisdom Tree, but leave them as you found them. Leave the cairns at Wisdom Tree alone, and resist the urge to create your own cairns on other trails. Don’t carve your name (or anything else) into trees and rocks to prove you were there. Let everyone else get a chance to enjoy it. And if you see someone defacing our trails? Don’t approach them, but please do report them. Enjoy the Sounds: … of mother nature! Sometimes the sound of the hike is the best part! If you must play music, do it on your headphones. We know you’re “so faaaaancy;” the rest of the park doesn’t need to hear it too. Thank you for keeping our trails wildly awesome! And thank you for being good role models for our hiking community! I hope to see you on a trail soon!